Where must curb ramps be provided?Generally, curb ramps are needed wherever a sidewalk or other pedestrian walkway crosses a curb. 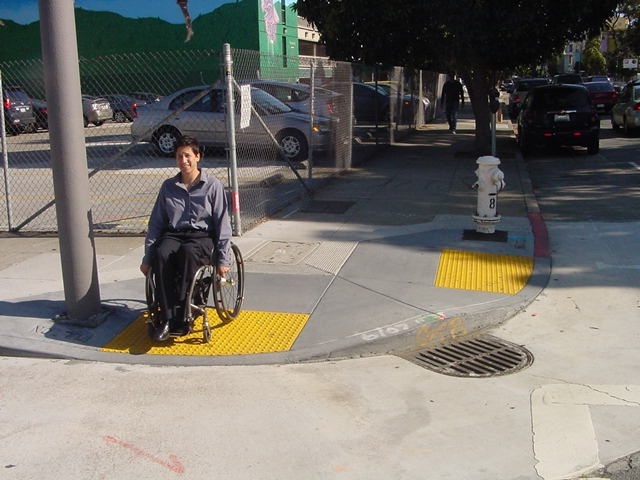 Curb ramps must be located to ensure a person with a mobility disability can travel from a sidewalk on one side of the street, over or through any curbs or traffic islands, to the sidewalk on the other side of the street. However, the ADA does not require installation of ramps or curb ramps in the absence of a pedestrian walkway with a prepared surface for pedestrian use. Nor are curb ramps required in the absence of a curb, elevation, or other barrier between the street and the walkway. When is resurfacing considered to be an alteration?Resurfacing is an alteration that triggers the requirement to add curb ramps if it involves work on a street or roadway spanning from one intersection to another, and includes overlays of additional material to the road surface, with or without milling. Examples include, but are not limited to the following treatments or their equivalents: addition of a new layer of asphalt, reconstruction, concrete pavement rehabilitation and reconstruction, open-graded surface course, micro-surfacing and thin lift overlays, cape seals, and in-place asphalt recycling. What kinds of treatments constitute maintenance rather than an alteration?Treatments that serve solely to seal and protect the road surface, improve friction, and control splash and spray are considered to be maintenance because they do not significantly affect the public's access to or usability of the road. Some examples of the types of treatments that would normally be considered maintenance are: painting or striping lanes, crack filling and sealing, surface sealing, chip seals, slurry seals, fog seals, scrub sealing, joint crack seals, joint repairs, dowel bar retrofit, spot high-friction treatments, diamond grinding, and pavement patching. In some cases, the combination of several maintenance treatments occurring at or near the same time may qualify as an alteration and would trigger the obligation to provide curb ramps. What if a locality is not resurfacing an entire block, but is resurfacing a crosswalk by itself?Crosswalks constitute distinct elements of the right-of-way intended to facilitate pedestrian traffic. Regardless of whether there is curb-to-curb resurfacing of the street or roadway in general, resurfacing of a crosswalk also requires the provision of curb ramps at that crosswalk.